I am not the inventor of this strategy. It is widely available on the internet, and I have no idea who was the originator.I have found it to be effective when using simple support/resistance methodology to manage trades. This is an exit strategy using 5-min chart, however, it can be easily applied to any time frames. The basic idea is to use lower time frame (about 4 to 6 times lower than trading time frame) to manage a position, and using support resistance to define a better exit. 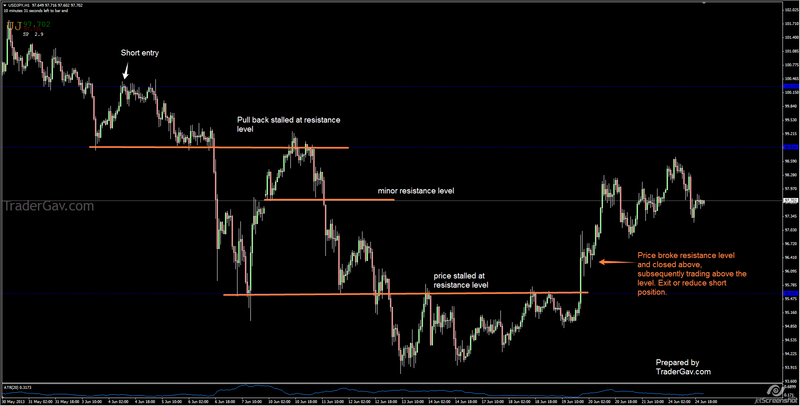 For example, if you are trading hourly trend, you can apply this strategy in M15/M5 to manage your position. I’ve found this strategy to be useful in my Forex trading. When previous resistance becomes support, it is time to consider exiting a SHORT position. 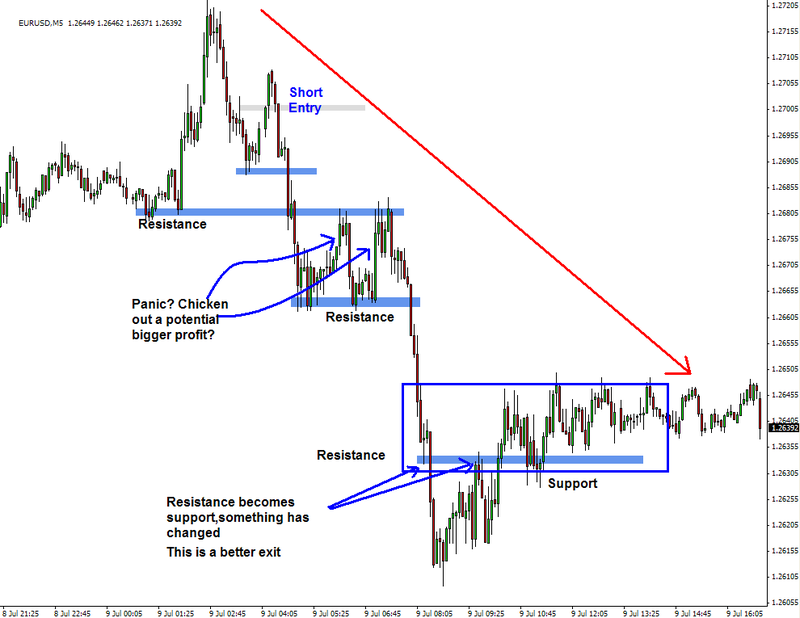 The EURUSD trade below is a good example to illustrate this strategy. Assuming we entered a short position at 1.27, and the market started to sell off, we decided not to set a hard profit target, instead we follow the price action to decide when to exit. Looking at the chart below, without a planned strategy , where would you exit? chicken out when there were small price bounces? Here is the idea. In a downtrend, price will form lower highs and lower lows. And previous support acts as resistance. By following this principle, we let the profit run until the previous resistance level was violated and becoming a new support level. This signals a potential trend change. Again, no strategy is perfect, we might still miss out some even bigger profit. However, in my personal opinion, it is good enough to manage short term position. Have a look at this method. The best forex trading strategies are the ones that know when to be aggressive (letting the profitable positions ride) and know when to exit promptly (to cut losses or take profit.) By using the simple concept of support and resistance, trader will be able to map the market and manage a position effectively. This post was originally written back in 2010. I have updated with up-to-date chart and refined the strategy. After a series of trades (more than 30 trades), if you� are having winning rate greater that 80%,� maybe it is time to look into your exit/profit taking strategy. Capital preservation is important. Risk management is important. 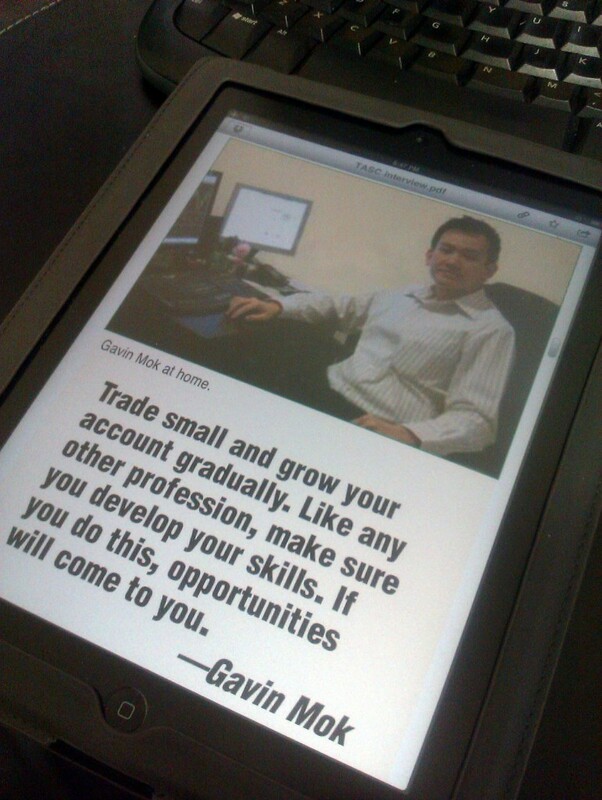 But trader’s job is to risk and make money, not sitting in the office to preserve capital. When it is time to trade, just trade. Capital is a tool for you to use to make more money, not for you to preserve. Looking out the window, you see it is raining. Put your hand out of the window, you know it is raining. And yet, you still feel the need to view the website or call Bureau of Meteorology to confirm if it is really raining. Some traders trade in this way. Is the the word “confirmation” really confirming something or it is just showing the lack of confidence of your own strategy, or even your own opinion? Here is quote from my interview with TASC some time ago. I thought it might help some of my 13 readers to kick start the new year. Here’s to a healthy and profitable 2012. Now, let’s get back to business.